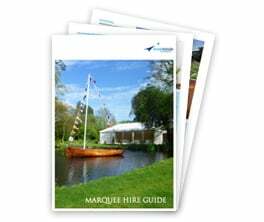 Most events require some form of furniture and we have everything you could need to deck out your venue and ensure that your guests have a great time. 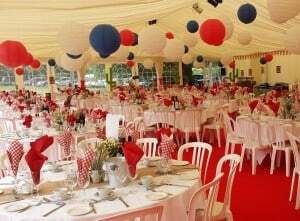 Furniture and the layout is an important aspect to consider when designing your marquee. 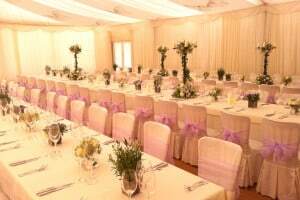 With years of experience behind us we can advise and guide your choice of tables and chairs and the best configuration to suit the numbers attending and ‘style’ of your event. 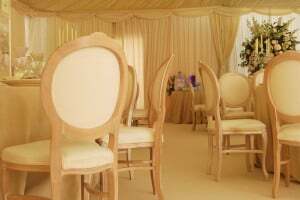 We offer a selection of round, square and long banqueting tables in various sizes to create the ideal layout to suit your purposes. 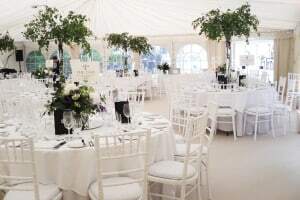 We can supply simple, classic white linen cloths and napkins, or a whole rainbow of colour choices to coordinate with your theme. We can also enhance your table displays with decorative runners and source other table dressings to create something truly special and deliver the ‘wow’ factor. 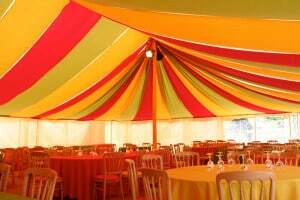 Many of the larger marquees we install are divided into sections to create different ‘spaces’ within the main area. From a reception area, to a bar, to a lounge zone for relaxing, we can supply everything from classic comfortable sofas and coffee tables to chic leather sofas and side tables for a more contemporary look. We have rattan sofas with ivory seats for a summer conservatory feel, or eye-catching illuminated cube furniture for a Mediterranean bar style. We offer bars for all budgets starting from simple and practical trestle tables dressed with tablecloths or if something more formal is required, we have bar counters in a range of colours to suit your theme. Or go the whole hog with a state-of-the-art LED lit bar available in a choice of eye-catching shapes and colours. We can provide back bars and refrigeration units for cold drinks and glass storage. 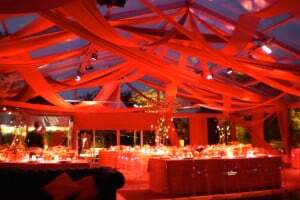 We can also supply friendly, experienced staff and a range of drinks for your event.